Prepare a demonstration showing how to use a solar cooker. Present your demonstration to another class of students or to a group of friends or relatives. For more help, refer to the Science Skill Handbook. Nary a soul in sight. And beer bottle caps from many years. And the chimney from a power station on the other side, A summer haze hung in the air, And the lazy drone of traffic far away. That came up where the pine cones crunched underfoot . . .
Wind up wrapped in decorous plastic, In this landfill where oxlips grew. . . Cause and Effect Recognizing cause-and-effect relationships can help you make sense out of what you read. One event causes another event. The second event is the effect of the first event. In the poem, the author describes the causes and effects of pollution and waste. What effects do pollution and the use of nonrenewable resources have on nature in the poem? 1. To plagiarize is to copy without giving credit to the source. In this poem, who or what has plagiarized beauty? 2. What do the four verses in the poem correspond to? 3. Linking Science and Writing Write a poem that shows how conservation methods could restore the beauty in nature. The poet makes a connection between the four seasons of the year and the pollution and waste products created by human activity, or civilization.For example, in the spring, a landfill for dumping garbage replaces a field of wildflowers. Describing four seasons instead of one reinforces the poet's message that the beauty of nature has been stolen, or plagiarized. 1. Natural resources are the parts of the environment that supply materials needed for the survival of living organisms. 2. Renewable resources are being replaced continually by natural processes. 3. Nonrenewable resources cannot be replaced or are replaced very slowly. 4. Energy sources include fossil fuels, wind, solar energy, geothermal energy, hydroelectric power, and nuclear power. Most air pollution is made up of waste products from the burning of fossil fuels. The greenhouse effect is the warming of Earth by a blanket of heat-reflecting gases in the atmosphere. Water can be polluted by acid rain and by the spilling of oil or other wastes into waterways. Solid wastes and hazardous wastes dumped on land or disposed of in landfills can pollute the soil. Erosion can cause the loss of fertile topsoil. You can reduce your use of natural resources in many ways. Reusing items is an excellent way to practice conservation. In recycling, materials are changed in some way so that they can be used again. Materials that can be recycled include paper, metals, glass, plastics, yard waste, and nonmeat kitchen scraps. 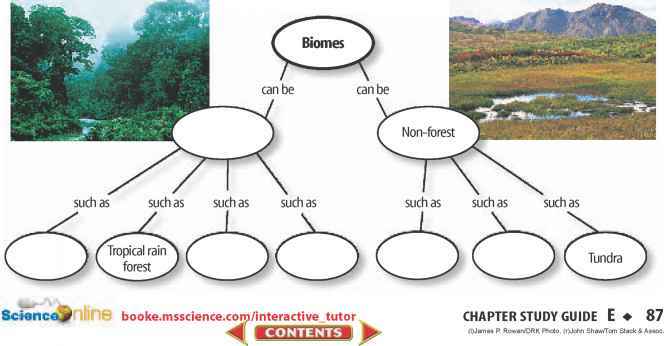 Copy and complete the following concept map using the terms smog, acid precipitation, and ozone depletion. Use the photo below to answer question 13. Explain the differences in the vocabulary words given below. Then explain how the words are related. Use complete sentences in your answers. Choose the word or phrase that best answers the question. 11. An architect wants to design a solar house in the northern hemisphere. For maximum warmth, which side of the house should have the most windows? 12. Of the following, which is considered a renewable resource? 13. Which energy resource is shown in the photo? 14. Which of the following is a fossil fuel? 15. Which of the following contributes to ozone depletion? 16. What is a substance that contaminates the environment called? 17. If there were no greenhouse effect in Earth's atmosphere, which of the following statements would be true? A) Earth would be much hotter. B) Earth would be much colder. C) The temperature of Earth would be the same. D) The polar ice caps would melt. 18. Which of the following can change solar energy into electricity? 19. Explain how geothermal energy is used to produce electricity. 20. Infer why burning wood and burning fossil fuels produce similar pollutants. Use the photos below to answer question 21. 21. Draw a Conclusion Which would make a better location for a solar power plant—a polar region (left) or a desert region (right)? Why? 22. Explain why it is beneficial to grow a different crop on soil after the major crop has been harvested. 23. Infer Is garbage a renewable resource? Why or why not? 24. Summarize Solar, nuclear, wind, water, and geothermal energy are alternatives to fossil fuels. Are they all renewable? Why or why not? 25. Draw Conclusions Would you save more energy by recycling or reusing a plastic bag? 26. Recognize Cause and Effect Forests use large amounts of carbon dioxide during photosynthesis. How might cutting down a large percentage of Earth's forests affect the greenhouse effect? 27. Form a hypothesis about why Americans throw away more aluminum cans each year. 28. Compare and contrast contour farming, terracing, strip cropping, and no-till farming. 29. Poster Create a poster to illustrate and describe three things students at your school can do to conserve natural resources. Use the table below to answer questions 30 and 31.